Last Saturday night Johnny Eames and the TRAD TKO Events team presented their latest offering, FAST & FURIOUS, a six fight show at the Cresset in Peterborough . It was the first time I’ve been at the Cresset and have to say I was mightily impressed with the venue, but even more so with the way the event’s sponsor Junction 17 Cars, who had invested a huge amount of their hard earned dosh on a Vegas Championship Boxing style lighting rig, bleacher seating and a multi camera set up, including two overhead cameras, beaming the show to huge screens in both the arena itself and the bar area. The Vegas style feel to the show was obviously affecting everyone, from the fighters and highly vociferous fans to the Master of Ceremonies, Craig Stephen, who aptly stated on announcing the headlining Freddie Turner versus Chris Jenkinson British Masters Gold title fight, “for those in attendance and the Millions around the World who wish they were here’, yes it was that good! Anyway enough about the awesome atmosphere and set up, let’s get onto the important stuff, the fights themselves. As I said above the headline bout see Canning Town’s Freddie Turner take on Bolton’s Chris ‘Twinny’ Jenkinson for the vacant British Masters Gold Light Middleweight Championship. Both Turner and Jenkinson have Championship pedigrees, Turner (pictured) being the current Southern Area Champ and Jenkinson a two time , two division International Masters Champion, so no surprise that both men took a little time to feel out the other in the first round. 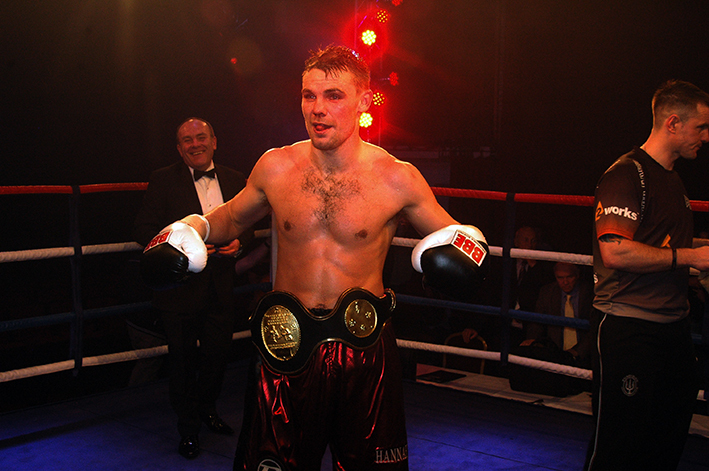 With legendary coach Jimmy Tibbs giving instruction from ringside, Turner put in a scintillating performance, throwing shots from every conceivable angle, with Turner winning out on most of the exchanges in the early rounds, Jenkinson relied on his previous championship experience to keep the rounds as close as possible. The sixth stanza proved to be a major defining round, in more than one way, firstly during a rather intense back and forth exchange Turner sent Jenkinson off balance and almost right down to the canvas, Jenkinson’s quick thinking see him momentarily touch down a glove, leaving the referee Robert Chalmers no option than to give a standing count. So, the second half of the bout see Jenkinson on the ascendancy, pushing Turner all the way for each and every second of the rounds. However first he had to overcome a strong start from Turner in the seventh. Turner targeted the heavily cut nose, that Jenkinson received in the previously mentioned sixth round incident, with crisp clean right hand jabs and the occasional left hand lead. Jenkinson kept his head and started slipping the jabs and targeting Turner’s body, with this tactic proving successful Jenkinson kept up the pressure to secure the seventh and eighth rounds. The ninth was a much closer affair, it could quite easily have gone either way, as both protagonists traded punches for virtually the entire hundred and eighty seconds. More of the same in the tenth, although Jenkinson’s work rate was keeping him in the ascendancy, having returned to working the body Jenkinson was once again able to keep Turner in check and secure the round. Once again it was Jenkinson calling the shots in round eleven, pressuring Turner throughout, however don’t go thinking it was all one way traffic, far from it, Turner pulled some classy combinations from within his well stocked arsenal. Round twelve was, hmm, let’s say interesting, for whatever reason Turner danced around the ring ducking and diving as Jenkinson tried in vain to land a meaningful shot, literally for the full three minutes I don’t recall Turner throwing a shot, let alone landing one, I might be wrong but don’t think so, to the same degree Turner’s footwork and movement was of such high quality I don’t think that Jenkinson could have landed more than just a couple of shots, most being ‘air’ shots flying past the phantom that was the incredibly agile Freddie Turner. After twelve highly entertaining and all action rounds it fell to referee Robert Chalmers to give his verdict, which was 115-112 victory for Freddie Turner. Main support for Turner-Jenkinson was a ten round International Masters Light Heavyweight Championship showdown between Portsmouth’s Joel McIntyre and Klaipeda, Lithuania’s Vygaudas Laurinkus. Like his TRAD TKO team mate Turner, McIntyre came into the bout with a Championship belt already in his trophy cabinet, the International Masters Silver. 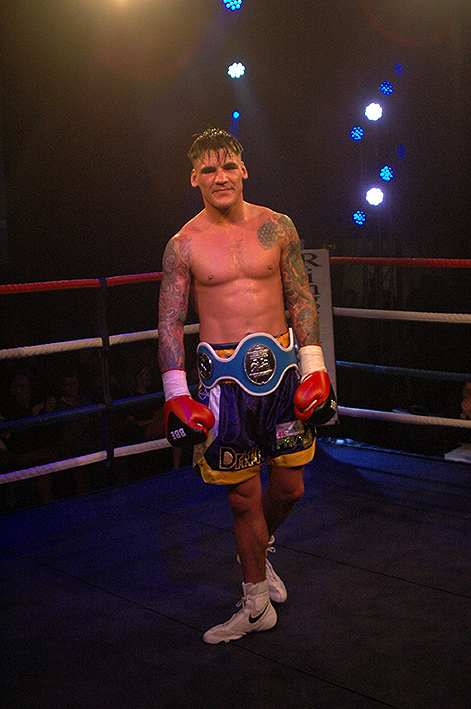 Unlike Jenkinson though, Laurinkus has yet to win a championship bout, his only previously title fight being against Dan Woodgate, for the very same belt that he was fighting for on Saturday night. Tony Oakey protégé McIntyre came out in a confident manner, taking the fight to the Lithuanian from the off, attacking both body and head in fast succession, the surprising fast start not only put Laurinkus on the back foot but also forced him to go ultra defensive throughout the first round. McIntyre dominated the next five rounds with relative ease, pressuring Laurinkus at every opportunity, boxing with confidence the Pompey man threw an array of combinations and power body shots throughout each, don’t get me wrong Launinkus responded as well as he could, but it was clear McIntyre was on a mission to impress, boy oh boy was he succeeding. Sensibly McIntyre slowed the pace in the seventh, still boxing beautifully but without quite the same level of quantity of punches or level of venom of the previous six, this may have given Laurinkus some false hope, as the Lithuanian attempted to pressure McIntyre, only for him to receive some mightily vicious counter punches for his efforts. Round eight through to the end it was a rerun of the early rounds, McIntyre putting on nothing short of a sensational display of boxing, showcasing his extensive arsenal and undoubted skills to an appreciative crowd, whilst Laurinkus could just cover up and take advantage of the merest sight of an opportunity to counter or pressure the Pompey man. After ten all action rounds it was no surprise that Referee Robert Chalmers scorecard showed Joel McIntyre being victorious by a virtually shut out 100-91 points margin. Next up was local hero Tommy Martin, unbeaten in six the St Neot’s teen was to get his wish and finally step up to a six rounder, against the far more experienced Dougie Curran from Newcastle. Whilst the Championship bouts were seriously excellent all action affairs, Martin versus Curran was something else and undoubtedly the fight of the night. From start to finish it was a true battle royale, Curran using his experience to the full, pressuring the youngster throughout, however Martin showed a maturity that belied his tender years. With each full on attack from the seasoned Geordie, Martin kept his cool, boxing supremely, utilizing his scintillating hand speed and stacked locker of combinations to full effect. By mid point Curran stepped up the ‘professional’ work, but instead of intimidating the nineteen year old, it had the opposite effect and Martin proved that he could hold his own against a ‘knowledgeable’ opponent, resorting to a few ‘moves’ of his own. The final couple of rounds resembled an all out war, making the previous rounds seem more like a mere skirmish in comparison, both men went at it hammer and tongs, but it was young Tommy Martin that was to vanquish his older and more experienced foe, in doing so securing his seventh victory with a shut out 60-54 points victory. The third fight of the night see another of the emerging TRAD TKO young stars, Paul Upton, in his third outing, against the seriously tough Kevin McCauly, who coincidently fought Upton’s sibling Sonny just three weeks previously. Without doubt McCauly wanted some sort of revenge on the Upton Clan, for the loss against Sonny, right from the start he took the fight to the Romford based youngster. The constant pressure was working to a degree, at times Upton appeared to be getting overwhelmed, but just as you thought McCauly was getting the upper hand, Upton would pull out a superb lightning fast combination or two to turn things around. In his previous fights young Upton was able to control his opponents with ease, but on Saturday he had his hands full, McCauly just wouldn’t back down, he just kept the pressure up from the opening minute to the final bell, however young Upton showed his mettle, as well as the undoubted skills that had secured him an array of national and international accolades as an amateur, to pull out a close 39-38 points victory. Prior to Upton-McCauly was supposed to see former Navy amateur star Ricky Rose make his professional debut, against Jason Nesbitt, but for whatever reason Nesbitt pulled out on Friday, leaving the Kent based youngster out on a limb. Thoroughly expecting not to fight after all, Rose was thrown a lifeline, as fellow TRAD TKO team mate Andy Gatenby, who had attended the event to support fellow John Murray trained Joel McIntyre, offered to step in. After Gatenby borrowed some kit, including shorts from Paul Upton, and the BBBofC agreeing to authorize the ‘exhibition’ bout, the ensemble crowd were treated to a sensational four round exhibition match. In my experience most exhibition matches are glorified sparring matches, but no one could have told either protagonists this, as they fought their hearts out for the full four rounds. Rose is a debuting Light Welter and Gatenby a 4-0 Featherweight, but believe me there was no quarter given, or expected, as these two warriors went to war. After two sensational all action rounds, a smiling referee Robert Chalmers leaned across the ropes and said to me “what a great bout, don’t they know it’s an exhibition though”, I have to agree as these boys were really going for it. No surprise the final two rounds were fought out at the same pace and intensity, after which both men received a much deserved standing ovation. Opening bout of the night see late addition Festim Lama, who stepped in after Jordan Gill had to pull out due to illness, face Brighton’s Nicky Jenman. Like the headline fight this was a fight of two halves, Jenman securing the first couple of rounds, due to his constant pressuring of the normally all action London based Albanian. Prompted by promoter Johnny Eames constantly shouting encouraging words to his charge, Lama stepped things up in the third and normal service resumed, with him becoming the aggressor. The change in approach from Lama was extreme, instead of waiting for Jenman to come to him Lama went on a full out attack, which proved enough for him to secure the final two rounds, as well as secure a draw for his efforts. I really cannot stress just how good the event was, everything about it was just right, actually better than right, the venue was first class, the matching by Jon Pegg was nothing short of spot on – Johnny Eames wants 50/50 fights and that’s just what Jon Pegg delivers – and Junction 17 Cars showed their commitment to making the event even more special than it already was, by bringing seriously professional Vegas style lighting, sound and film rigs etc.